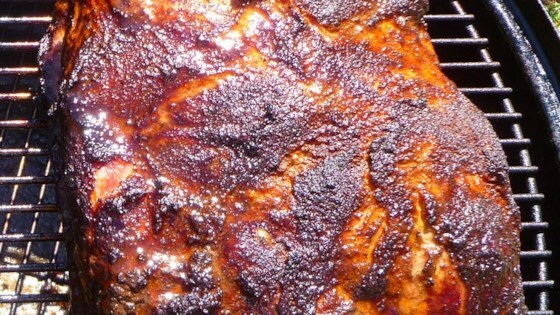 "This is the correct way to smoke a pork shoulder with professional results--from the brine, to the rub and sauce, to the rave reviews you will receive. Smoke is the key to breaking down the fat which adds flavor and moisture to the shoulder. Place in a bun with your favorite BBQ sauce." Place pork shoulder in a large pot and add enough apple cider to cover. Combine white sugar, brown sugar, salt, paprika, onion powder, black pepper, and garlic powder in a bowl. Mix about 1/4 cup sugar rub into cider; reserve remaining rub. Cover pot and refrigerate for 12 hours. Prepare smoker to about 210 degrees F (99 degrees C). Add enough wood chips to smoker. Pour cider brine into the water pan of the smoker; add onion and about 1/4 cup more sugar rub. Spread remaining rub over pork shoulder. Transfer pork to the center of smoker. Smoke pork until very tender, about 8 hours. Monitor hickory chips and liquid, adding more wood and water, respectively, as needed. Transfer pork to a large platter and cool for 30 minutes before shredding with forks.